LOL @ time-fridge. Whose idea was that? (well, this Macbook Air is a little hint). @pawelz: Hard to tell. 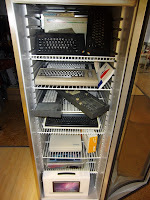 But since the fridge was DOA (Dead On Arrival), Macbook Air somehow seems like a good fit (Defective By Design). 8-bit computers are still operational, though. First of all, I'm glad you described your experiences. I had an occasion to see your presentation during AgileWarsaw meeting and was looking forward to hearing about the results. We started to organize our workshops/techtalks about 6 months ago. But we didn't make the presentation obligatory for everyone (you mentioned one of the arguments against this idea). Unfortunately many developers say that they have no free time to prepare a good presentation. How do you deel with that problem? Maybe, your colleagues are allowed to work on the presentation during workhours ? If not, do these non-volunteer guys complain about being made to do sth after work ? @Karol Yes, we are "allowed" to prepare during work hours, but to get the whole picture, you need to know that we usually do not do micromanagement at TouK, and as a result you are responsible for planning and managing your own time, and getting the work done. Most people give a presentation on a subject that they are already using at work (Guava, Spring Social, MVP and command pattern in GWT, Acrtiviti, and so on), so it's much easier because you don't have to spend so much time to get prepared. Some, show the stuff they work on at home anyway (Vaadin, Grails, Smartclient) because they think it's cool. We have a page, where everybody can post what they would like to hear about, so we can pick up and include this stuff in our new projects (like Jboss Envers), to get all the needed experience. This way it's really easy and not time consuming. So far, nobody was complaining any further. a) we have a small conference room, for max 15 people (or 20 employees as we are so relaxed it's fine with us to seat on the floor). Sometimes people cannot join the meeting, because the room is full already. b) some people are shy and may not want to show their presentations to strangers. I'd rather have our people happy than be more open. c) during workshops we often have 'inside-talks' about how the topic relates to our internal projects. This of course is non public information and would require NDA for any outsiders. All together it's a bit risky subject. Let us see whether we can cooperating with other companies first, before we become so public.